How do we decide which Refugees deserve care? 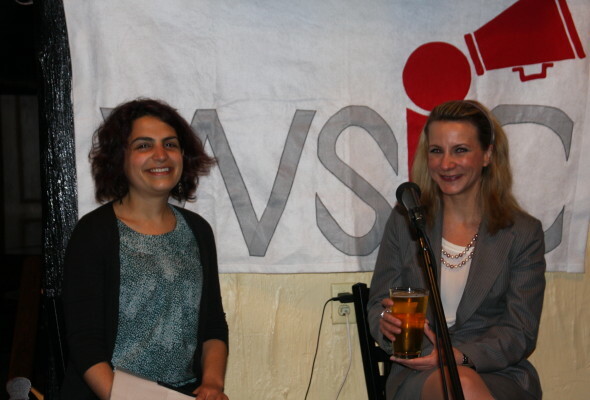 On April 20 WSIC held our regular downtown event at a special location. 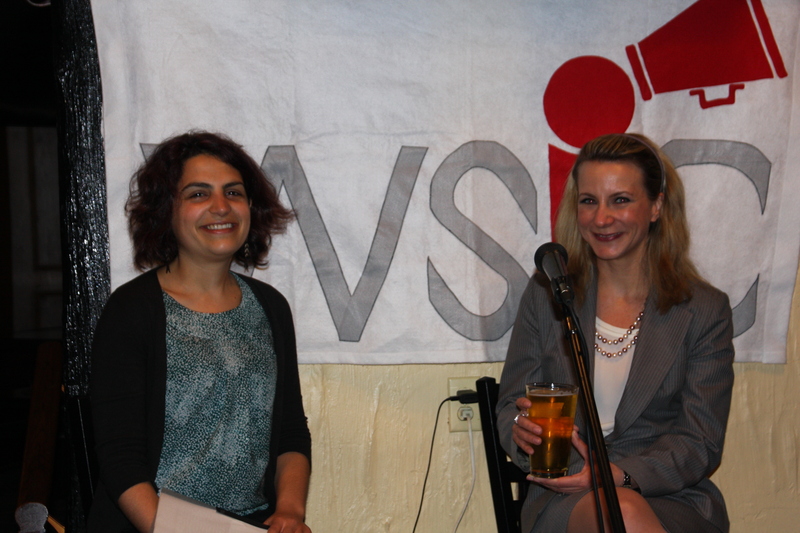 We were at our North York location, the Rose and Crown (2335 Young St) to discuss refuge health care. Sam Green, a physician who work with refugees and Chantal Desloges, Ontario Bar Association’s resident expert on refugee law formed our panel on the issue of refugee health care. Sam Green began by describing her personal experiences with refugees in Canada. Firstly, as a society, we need to recognize that people who arrive here as refugees are unlikely to be able to pay for healthcare. She recounted her experiences with people who were denied basic health care access in Canada leading them to further health complications that were either covered at a higher cost, or lead to severe consequences. There is no evidence that the cuts are actually saving Canadians any money. She described the Interim Federal Health program which has exists since WWII to help refugees with their health care needs, This program was cut in 2012 to save money – equivalent to 60 cents per Canadian over a five year time line effectively downloading the costs to the province. She brought up the fact that refugee claims are now processed in 15 days. This is both a benefit because the claims are dealt with quickly, but can also be a burden because it can take a while for claimants to gather the necessary paperwork. Refugees fleeing precarious situations often don’t have all the documentation they need. To give only 15 days to come up with it leaves many refugees unable to prove their status and situation. Green also touched upon the issue of “safe” countries, or Designated Countries of Origin. these are deemed safe by the government regardless of who the claimant is or personal circumstances, but have well know sub-populations that are discriminated against. The Roma and LGBT population in Hungary was brought up as an example. There are many Roma families in hiding in Canada to avoid deportation. Part of the cuts stipulated that people arriving from safe countries are provided care only if it is proven to be threat to public health. This is almost never the case. An individual with a heart attack or a pregnant woman is seldom a threat to the broader public. Green recounts watching a man in downtown Toronto with a heart attack get turned away. “This shouldn’t happen in our country” she said. Thankfully, in Nov 2014 the Supreme Court of Canada rules that the cuts violated the Charter of Rights and Freedoms. However, a finding that a law is unconstitutional doesn’t automatically mean the law reverts to its former state. Only some cuts have been restored while the many refugees still find themselves in situations where they are unable to pay for the healthcare that they need. The indignity and stress of not knowing how the next prescription will be filled is quite a bit of stress that doesn’t need to take place. The issue of Temporary Foreign Workers was also touched on briefly by Green. Though they have coverage (after the 3 month waiting period) there is an issue of access. If one is deep in the oil sands are far away on a remote farm, getting access to health care is an issue despite there technically being coverage available. Chantal Desloges told us about the positive and negative changes during the past few years from a legal perspective. She pointed out that the court is very conservative in general, and yet still found this an egregious miscarriage of justice on the part of the federal government. Desloges walked the crowd through the court’s decision to strike down the cuts to the IFH program. The government focused on four points: Costs; fairness to Canadians; wanting to protect the health of Canadians; protection of the integrity of the system. The primary challenge came under 3 points. 1 – The right to life liberty and security; which was struck down on a technicality. 2 – Cruel and unusual punishment; upheld for the first time outside of a prison situation. Courts found it was cruel and unusual to force people to beg charities and friends to get their next dose of medication. 3 – Discrimination based on race; upheld due to blantant discrimination based on country of origin. The court found expert evidence that the government had never produced any studies to support their point about cost savings. It noted that no study shows people come to Canada for health care. It also shows that the savings claims were completely unsubstantiated. There are no winners when refugees from war torn countries are denied post traumatic stress treatment. If we accept people into our country, we should welcome them and give them the care they need. If we want to add to our pool of productive citizens, we need to treat them with a high level of respect and dignity. Deloges also pointed out that not all changes to the refugee system was bad. One good thing is how fast applications can now be processed, though it is a double edge sword since refugees often can’t their papers gathered in time. Another great change is the appeals process. Before the change, there was no formal appeal process if a claimant was denied. Now the process is much more transparent. We had vigorous discussions that touched people deeply about their concern for those who attempt to find refugee in Canada. Perhaps a good way to summarize the questions is through the following: do we want to ask the question who deserves to be healthy?